What farms tweet to reach? What Facebook page makes you look? - JP loves LIFE! What farms tweet to reach? What Facebook page makes you look? 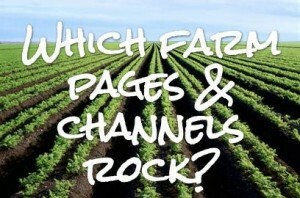 You may have already seen the post asking people to provide their opinions on the best farm blogs — well, this is for some of the other channels. If you are more into Facebook, YouTube, etc. you can make sure the sources of great farm information get shout-outs by submitting them here. Be sure to paste in the URLs for the sites you are recommending. Since there are text areas, you can add comments advocating for whatever you think others should know (within reason). Please remember the category as you recommend someone…. if it’s the food category at least some of the posts should be food related. If someone submits a blog, page, etc that isn’t regularly updated, we’ll assume that was accidental and will pull it. There should have been posts at least within the past month. I’m going to have this active for a month (Will close at 8 a.m. on August 19). That’s plenty of time for people to give some thought to it & answer. And what’s cool is it will close just before the AgChat Training Conference! I’d appreciate email addresses be submitted — may need to followup with some questions but I will not be using them routinely for other things, so no worries. Remember this is global…. would love to have farmers in the UK, Australia, Brazil, India, etc participate! « What’s your favorite farm blog?